Chad Wachs: Machine Gun Camp?? 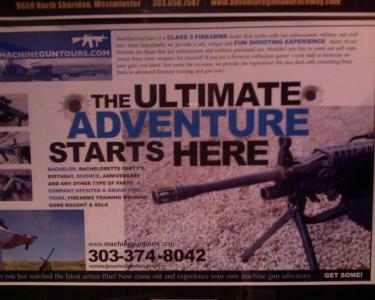 Couldn't help but notice this ad in front of me in a restroom of a local watering hole... It is advertising machine gun camp. Basically take a day shooting machine guns - presumably at a target of some sort. What I found funny was the ad listed a number of "events" that this activity would be appropriate for: Birthdays, Bachelor Parties, Corporate Outings, etc. What amused me was the 2 events that were highlighted: Bachelor Parties and Divorce. Nice. You can start and end your marriage with machine guns.